Dealing with PDF files may be associated with another problem of charging the right amount to a client. In translation business number of words in a source file is considered to be a very common basis for invoicing. Such functionality is provided by most of the CATs, including Trados, MemoQ and the rest. So, that is basically not a problem once a regular Word file is received. The word count can be roughly estimated using MS Word functionality, though this way repetitions (repetitive segments such as sentences) are not considered at all, which may give a competitive edge as we do not charge for 100% repetitions. Why would you have to pay for a segment that has already been translated and looks completely the same as the previous one? And the same segment may occur several times within a text. However how do you count pictured PDFs? In this case we have to charge for the time spent preparing files for translation and translating them. Since we do care about our customers and still would like to survive in the market (competition is very tough nowadays) we charge only the time we spent to make the files understandable to our customers. Looks a bit sophisticated but this desktop tool keeps track of absolutely all the computer activity! You can even see which browser tabs you were viewing at a given time. So, time spent for a particular assignment can be tracked quite precisely. 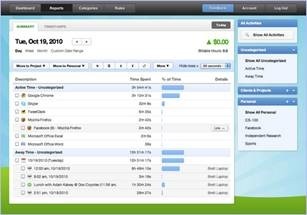 The only limitation is that standard (free) version won’t let you track a specific task. Basically the features we’re after (reports, keyboard activity) are mostly available in full version at $67. Standard version can also provide reports though looking good on your screen (you will get all the charts or tables whichever you like best) may not ne that practical on paper. Very simple tool with all the necessary features. It differs from Manic Time in that it only tracks the time spent on a particular project. Pops out every 5 minutes that keyboard is not touched, though this interval can be adjusted to your needs. 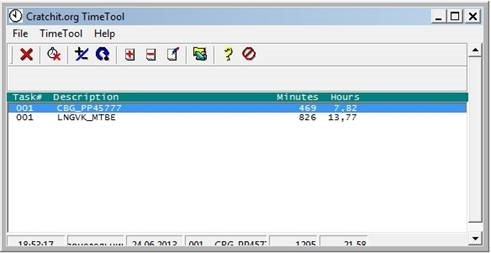 The software has a powerful reporting feature to tab delimited format (.*csv). 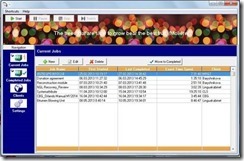 It can even be used to make invoices! Though this functionality was not what we were looking for therefore is not covered here in full detail. As for compatibility with 64-bit Windows it has run very well. The program is available for $47 only with 21 day trial. Apple fans will find it useful for their i-gadgets. The application competes with Exact Spent in terms of functionality and simplicity but looks and runs much better. 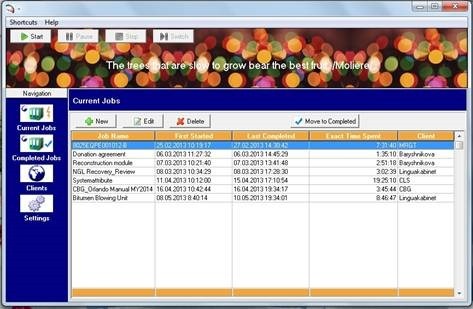 Chrometa is a web-based time tracking application. Similar to Manic Time it also keeps track of all the computer activity. The difference is it requires Internet connection and takes some bandwidth which maybe critical for those who are using slow connection. The reports are pretty much descriptive and provide enough information though lack of Cyrillic support maybe quite disappointing for a Russian agency running some of their software in Russian, so such applications in the report look like some kind of Greek abracadabra. Invoices are also possible though that’s not what we had been after. The company offers several tariff plans to track your computer activity which makes it the most expensive of all the other software under study. 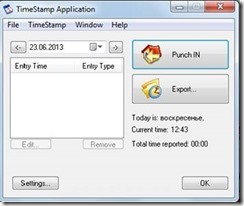 Time Stamp is another simple and what maybe important FREE tool to track your project time. 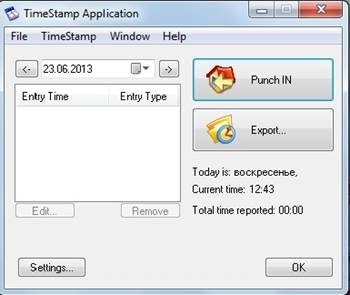 To start tracking just Punch IN and do not forget to Punch OUT when pausing a job. The application runs well on 64-bit Windows and provides quite a descriptive report to serve good proof for the customers. Similar to Time Stamp and the simplest of all is free Cratchit application. Spartan design, no keyboard activity tracking may be good for those who are looking just for basic features of a stopwatch. A very simple desktop time tracker similar to Office Time. Minimalistic user interface and a set of all the necessary functions to track any project could make this product an indispensable application for every freelancer paid on an hourly basis. The company, Advanced International Translations, is mostly famous for their project management tools for companies and freelance translators. That is why perhaps this product seems a bit unfinished. Poor or better to say no support of 64-bit Windows, regardless of keyboard activity recording and proper reporting combined with EUR18 per single license price makes this product a second choice to Office Time, which at USD47 provides better stability and attractive design.